EVERY year, the American Institute of Aeronautics and Astronautics awards prizes for the best papers presented at its annual conference. Last year’s winner in the nuclear and future flight category went to a paper calling for experimental tests of an astonishing new type of engine. According to the paper, this hyperdrive motor would propel a craft through another dimension at enormous speeds. It could leave Earth at lunchtime and get to the moon in time for dinner. There’s just one catch: the idea relies on an obscure and largely unrecognized kind of physics. Can they possibly be serious? The AIAA is certainly not embarrassed. What’s more, the US military has begun to cast its eyes over the hyperdrive concept, and a space propulsion researcher at the US Department of Energy’s Sandia National Laboratories has said he would be interested in putting the idea to the test. And despite the bafflement of most physicists at the theory that supposedly underpins it, Pavlos Mikellides, an aerospace engineer at the Arizona State University in Tempe who reviewed the winning paper, stands by the committee’s choice. “Even though such features have been explored before, this particular approach is quite unique,” he says. Unique it certainly is. If the experiment gets the go-ahead and works, it could reveal new interactions between the fundamental forces of nature that would change the future of space travel. Forget spending six months or more holed up in a rocket on the way to Mars, a round trip on the hyperdrive could take as little as 5 hours. All our worries about astronauts’ muscles wasting away or their DNA being irreparably damaged by cosmic radiation would disappear overnight. What’s more the device would put travel to the stars within reach for the first time. But can the hyperdrive really get off the ground? The answer to that question hinges on the work of a little-known German physicist. Burkhard Heim began to explore the hyperdrive propulsion concept in the 1950s as a spin-off from his attempts to heal the biggest divide in physics: the rift between quantum mechanics and Einstein’s general theory of relativity. Quantum theory describes the realm of the very small – atoms, electrons and elementary particles – while general relativity deals with gravity. The two theories are immensely successful in their separate spheres. The clash arises when it comes to describing the basic structure of space. In general relativity, space-time is an active, malleable fabric. It has four dimensions – three of space and one of time – that deform when masses are placed in them. In Einstein’s formulation, the force of gravity is a result of the deformation of these dimensions. Quantum theory, on the other hand, demands that space is a fixed and passive stage, something simply there for particles to exist on. It also suggests that space itself must somehow be made up of discrete, quantum elements. In the early 1950s, Heim began to rewrite the equations of general relativity in a quantum framework. He drew on Einstein’s idea that the gravitational force emerges from the dimensions of space and time, but suggested that all fundamental forces, including electromagnetism, might emerge from a new, different set of dimensions. Originally he had four extra dimensions, but he discarded two of them believing that they did not produce any forces, and settled for adding a new two-dimensional “sub-space” onto Einstein’s four-dimensional space-time. In Heim’s six-dimensional world, the forces of gravity and electromagnetism are coupled together. Even in our familiar four-dimensional world, we can see a link between the two forces through the behaviour of fundamental particles such as the electron. An electron has both mass and charge. When an electron falls under the pull of gravity its moving electric charge creates a magnetic field. And if you use an electromagnetic field to accelerate an electron you move the gravitational field associated with its mass. But in the four dimensions we know, you cannot change the strength of gravity simply by cranking up the electromagnetic field. In Heim’s view of space and time, this limitation disappears. He claimed it is possible to convert electromagnetic energy into gravitational and back again, and speculated that a rotating magnetic field could reduce the influence of gravity on a spacecraft enough for it to take off. When he presented his idea in public in 1957, he became an instant celebrity. Wernher von Braun, the German engineer who at the time was leading the Saturn rocket programme that later launched astronauts to the moon, approached Heim about his work and asked whether the expensive Saturn rockets were worthwhile. And in a letter in 1964, the German relativity theorist Pascual Jordan, who had worked with the distinguished physicists Max Born and Werner Heisenberg and was a member of the Nobel committee, told Heim that his plan was so important “that its successful experimental treatment would without doubt make the researcher a candidate for the Nobel prize”. But all this attention only led Heim to retreat from the public eye. This was partly because of his severe multiple disabilities, caused by a lab accident when he was still in his teens. But Heim was also reluctant to disclose his theory without an experiment to prove it. He never learned English because he did not want his work to leave the country. As a result, very few people knew about his work and no one came up with the necessary research funding. In 1958 the aerospace company BÃ¶lkow did offer some money, but not enough to do the proposed experiment. While Heim waited for more money to come in, the company’s director, Ludwig BÃ¶lkow, encouraged him to develop his theory further. Heim took his advice, and one of the results was a theorem that led to a series of formulae for calculating the masses of the fundamental particles – something conventional theories have conspicuously failed to achieve. He outlined this work in 1977 in the Max Planck Institute’s journal Zeitschrift fÃ¼r Naturforschung, his only peer-reviewed paper. In an abstruse way that few physicists even claim to understand, the formulae work out a particle’s mass starting from physical characteristics, such as its charge and angular momentum. Yet the theorem has proved surprisingly powerful. The standard model of physics, which is generally accepted as the best available theory of elementary particles, is incapable of predicting a particle’s mass. Even the accepted means of estimating mass theoretically, known as lattice quantum chromodynamics, only gets to between 1 and 10 per cent of the experimental values. But in 1982, when researchers at the German Electron Synchrotron (DESY) in Hamburg implemented Heim’s mass theorem in a computer program, it predicted masses of fundamental particles that matched the measured values to within the accuracy of experimental error. If they are let down by anything, it is the precision to which we know the values of the fundamental constants. Two years after Heim’s death in 2001, his long-term collaborator Illobrand von Ludwiger calculated the mass formula using a more accurate gravitational constant. “The masses came out even more precise,” he says. After publishing the mass formulae, Heim never really looked at hyperspace propulsion again. Instead, in response to requests for more information about the theory behind the mass predictions, he spent all his time detailing his ideas in three books published in German. It was only in 1980, when the first of his books came to the attention of a retired Austrian patent officer called Walter DrÃ¶scher, that the hyperspace propulsion idea came back to life. DrÃ¶scher looked again at Heim’s ideas and produced an “extended” version, resurrecting the dimensions that Heim originally discarded. The result is “Heim-DrÃ¶scher space”, a mathematical description of an eight-dimensional universe. From this, DrÃ¶scher claims, you can derive the four forces known in physics: the gravitational and electromagnetic forces, and the strong and weak nuclear forces. But there’s more to it than that. “If Heim’s picture is to make sense,” DrÃ¶scher says, “we are forced to postulate two more fundamental forces.” These are, DrÃ¶scher claims, related to the familiar gravitational force: one is a repulsive anti-gravity similar to the dark energy that appears to be causing the universe’s expansion to accelerate. And the other might be used to accelerate a spacecraft without any rocket fuel. This force is a result of the interaction of Heim’s fifth and sixth dimensions and the extra dimensions that DrÃ¶scher introduced. It produces pairs of “gravitophotons”, particles that mediate the interconversion of electromagnetic and gravitational energy. DrÃ¶scher teamed up with Jochem HÃ¤user, a physicist and professor of computer science at the University of Applied Sciences in Salzgitter, Germany, to turn the theoretical framework into a proposal for an experimental test. The paper they produced, “Guidelines for a space propulsion device based on Heim’s quantum theory”, is what won the AIAA’s award last year. Claims of the possibility of “gravity reduction” or “anti-gravity” induced by magnetic fields have been investigated by NASA before (New Scientist, 12 January 2002, p 24). But this one, DrÃ¶scher insists, is different. “Our theory is not about anti-gravity. It’s about completely new fields with new properties,” he says. And he and HÃ¤user have suggested an experiment to prove it. This will require a huge rotating ring placed above a superconducting coil to create an intense magnetic field. With a large enough current in the coil, and a large enough magnetic field, DrÃ¶scher claims the electromagnetic force can reduce the gravitational pull on the ring to the point where it floats free. DrÃ¶scher and HÃ¤user say that to completely counter Earth’s pull on a 150-tonne spacecraft a magnetic field of around 25 tesla would be needed. While that’s 500,000 times the strength of Earth’s magnetic field, pulsed magnets briefly reach field strengths up to 80 tesla. And DrÃ¶scher and HÃ¤user go further. With a faster-spinning ring and an even stronger magnetic field, gravitophotons would interact with conventional gravity to produce a repulsive anti-gravity force, they suggest. DrÃ¶scher is hazy about the details, but he suggests that a spacecraft fitted with a coil and ring could be propelled into a multidimensional hyperspace. Here the constants of nature could be different, and even the speed of light could be several times faster than we experience. If this happens, it would be possible to reach Mars in less than 3 hours and a star 11 light years away in only 80 days, DrÃ¶scher and HÃ¤user say. So is this all fanciful nonsense, or a revolution in the making? The majority of physicists have never heard of Heim theory, and most of those contacted by New Scientist said they couldn’t make sense of DrÃ¶scher and HÃ¤user’s description of the theory behind their proposed experiment. Following Heim theory is hard work even without DrÃ¶scher’s extension, says Markus PÃ¶ssel, a theoretical physicist at the Max Planck Institute for Gravitational Physics in Potsdam, Germany. Several years ago, while an undergraduate at the University of Hamburg, he took a careful look at Heim theory. He says he finds it “largely incomprehensible”, and difficult to tie in with today’s physics. “What is needed is a step-by-step introduction, beginning at modern physical concepts,” he says. The general consensus seems to be that DrÃ¶scher and HÃ¤user’s theory is incomplete at best, and certainly extremely difficult to follow. And it has not passed any normal form of peer review, a fact that surprised the AIAA prize reviewers when they made their decision. “It seemed to be quite developed and ready for such publication,” Mikellides told New Scientist. It may be a long while before we find out if he’s right. In its present design, DrÃ¶scher and HÃ¤user’s experiment requires a magnetic coil several metres in diameter capable of sustaining an enormous current density. Most engineers say that this is not feasible with existing materials and technology, but Roger Lenard, a space propulsion researcher at Sandia National Laboratories in New Mexico thinks it might just be possible. Sandia runs an X-ray generator known as the Z machine which “could probably generate the necessary field intensities and gradients”. 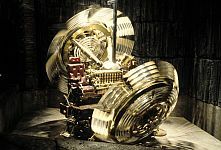 Is it possible to actually build a machine that allows one to travel through time faster than we do from moment to moment in our daily lives, sort of like what we see in movies? YES, but only to a point, and no, this is NOT science fiction. Is it easy, and could one do this at home or in their backyard? NO, AND DO NOT EVEN TRY. Has such dramatic technology actually been developed, and did it work? Where and when you might ask? It began in Nazi Germany during the last several years of World War II in their pursuit of wonder weapons. Start by reading two superb books: 1) The Hunt For Zero Point by Nick Cook, and 2) The SS Brotherhood of the Bell by Joseph P. Farrell. Also check out the The Alien History of Planet Earth hosted by Nick Cook as well as The Nazi UFO Conspiracy, both on The History Channel. All are excellent primers on this material. Has any further work been done on such radical, cutting-edge, physics? The answer is somewhat convoluted, but here goes. 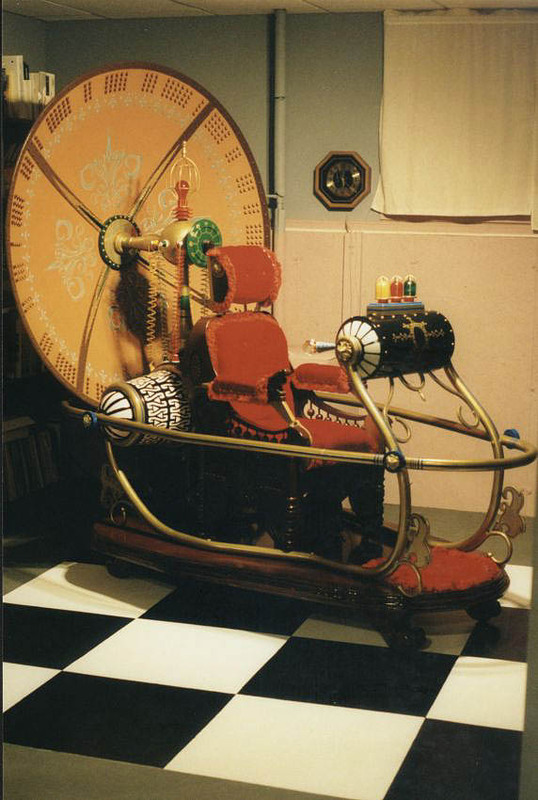 During the mid-1970’s during our descent to the conference room at UCLA’s Neuropsychiatric Institute which we used for our psi training groups, a visitor, a relatively young Asian woman, started talking to me about a U.S. government funded time machine project that was being conducted. She said that such a machine was indeed under development and there had been some success in terms of it’s operation. I asked her why her, a total stranger, had even brought this matter up to me. Her answer was that after reading several articles I had published on time, she automatically assumed that I knew of, or was even part of the project. I told her that I was not and that I had never heard of such an R&D program. Needless to say, I asked many questions like: the machine’s power source, actual principles of operation, etc. The young lady was quite mum from that point on and refused to talk further on the subject. I asked for her phone number and she refused to give it to me so I have her my card with the lab’s number and my home number on the back. Strangely, she never returned to our group again, nor did I ever hear from her again either. 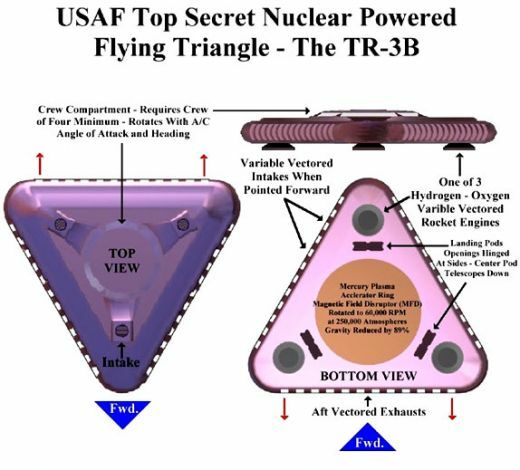 However, there’s some compelling evidence that the military is already using what’s referred to as a magneto-plasma toroidal propulsion system in a highly classified, delta-shaped stealth aircraft known as the TR3-B from Lockheed Martin. This propulsion system reduces the TR-3B’s mass and inertia to a very small fraction of what it would be otherwise, thereby allowing small amounts of thrust to achieve very high rates of acceleration without g-loading the airframe or pilots. You may ask what anti-gravity (electro-gravitic) propulsion has to do with time travel? The answer is EVERYTHING! Lockheed-Martin’s nuclear powered TR3-B magneto-plasma propulsion system? Why haven’t we people heard of this? This type of technology is more probably a deeply classified, black program without any congressional oversight whatsoever, along with most of the related Zero Point Energy and UFO technology. It offers the most dramatic change in the way we’ve been living since the dawn of the industrial revolution in that it would immediately obsolete all form of energy production: coal, oil, nuclear and hydroelectric. In fact, this Zero Point Energy technology even dwarfs any potential thermonuclear (fusion) reactor technology. Is it free energy, NO. And while there’s no heat associated with Zero Point Energy, as it’s most likely endothermic in nature, it still must be accessed or coupled with via an electro-mechanical device that is exothermic (heat producing) and as such must be built, distributed and sold, just like everything else on earth. The difference here is that there would not be the ever-present need for a power grid, for each building, home, car, bus, truck and plane would have a small Zero Point Energy (ZPE) reactor within it, without the hazardous radiation normally associated with nuclear power. Does this process and mechanism related to such real time travel involve technology that is also directly applicable to superluminal, interstellar propulsion systems like warp drive? It must be made very clear that this technology does not require one to reach speeds near that of light in order for it work. In fact, this approach has never even been openly discussed in technical literature over the years for many reasons, chief of which is the control of power and its weaponization potential, which is not focus of this discussion. 1. A shielded, controlled laboratory facility located far from prying eyes and the power grid. 2. Access to electronic components only used in building directed energy weapons, and fusion reactor research for the most part. If you try ordering ultra-diodes or ultra-capacitors and are not employed by a defense contractor or one of the national labs like Sandia, Los Alamos, or Lawrence Livermore, etc., you’re going to be visited by the FBI and Homeland Security within minutes with their guns drawn and safety’s off. THIS IS NOT A JOKE. 3. A mercury superfluid, that is, a superconducting (super-cooled to -450 degrees Fahrenheit/5.3722 degrees Kelvin) mercury based plasma with embedded and suspended niobium particulates, i.e., Einstein-Bose Condensate, a superfluid for lack of a better term. Time Machine console, Time After Time, 1979. 4. A toroidal confinement mechanism that can electromagnetically contain, suspend and drive this mercury superfluid plasma to a minimum of 70,000 rpm and at 250k atmospheres of pressure (3,675,000 pounds per square inch) is essential. There must be counter-rotating mercury superfluid plasmas, one clockwise, the other counter-clockwise in order to move only through temporal space as opposed to simply attaining faster-than-light (FTL) velocities required for interstellar flight. in diameter. The human occupants and cargo are contained within the insulated and centrally located cockpit where controls are located. From the outside working inward, the space between the first and second hull contains the mercury superfluid rotating clockwise. The space between the second and third hull contains the counterclockwise-rotating mercury plasma, and the third hull acts as an insulator between the plasmas and the cockpit cabin for the traveler. 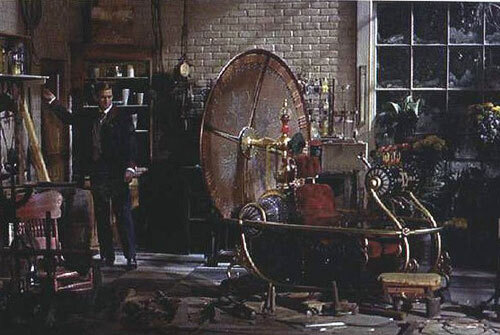 Unfortunately, there’s no resemblance whatsoever to the time machine so beautifully depicted in George Pal’s 1960 movie The Time Machine. 6. This mechanism taps into the Zero Point field and thereby generates what’s known as a torsion field which initiates frame dragging effects. Essentially, you’re created a very precisely manipulated worm hole that initially decouples you from gravity and then uses such forces to make time and space around this vessel move at a dramatically accelerated rate compared to outside the machine. Basically, you’re not moving, but space and time are, very rapidly. There was a very relevant line of dialogue in the 2009’s new Star Trekmovie where the aged Spock shows the very young Lt. Commander Montgomery Scott how to successfully achieve transporter function when moving at warp speed. When young Scott sees Spock’s equation, he utters the comment “Imagine that, who would think that space was the thing that was actually moving?” This line was quite prescient in my opinion. However, what’s really important to understand at this point is that this machine does in fact generate the power required to travel in time, the field’s purpose is to accesses or tap into the ubiquitous zero point field. And although the generated Zero Point Energy power field from the counter-rotating mercury plasmas is endothermic in nature, it could possibly be viewed as equivalent to a very high petawatt EMF output. (temporally speaking, that is) from home. Let’s say that you decided to jump forward one entire year into the future. You punch in the temporal coordinates and you travel that distance in less than a second. You step out and start walking around. Everyone asks where you were for the last year, but you cannot tell them. You were deemed to be a missing person. And in reality, you were. But, now comes the real-world problem with time travel. You cannot then get back into the time machine and travel back to the point you started a year earlier and live out the time you’ve missed, because you were never there for that 365-day period. You could continue moving forward in the machine and watch the future unfold as it will, but you cannot go back and be physically present here in 3-D reality when you were not. Another example illustrates this problem with even greater clarity. Several weeks ago there was a $640 million Mega-Millions Lottery around the country, the numbers of which were to be picked at 8 p.m. on Friday night. So on the receding Wednesday, you get into your time machine and jump ahead to 9 p.m. on Friday to learn the correct numbers. You then return to Wednesday evening and bet the winning numbers, right. WRONG. This would be a major causality problem in that once you’ve gone past the point in time where the winning numbers were chosen you’ve forever passed that temporal location and you had not purchased any lottery tickets whatsoever, let alone the winning one, as someone else did. You cannot then return to the point in time you started at with the winning lottery numbers because you never purchased them to begin with at that time. Moreover, you cannot have it both ways. Either you accurately picked the winning numbers before you jumped into the future with the machine, or you did not. This is one instance where you cannot have your cake and eat it too. Conversely, you cannot go back in time and have any form of physical interaction between yourself and the past for the same reasons just cited. What if you tried to go back thousands of years ago, long before you or the time machine even existed? I suspect that you’d either destroy yourself in the attempt or you’d end up in some odd temporal space wherein you could observe the past as if watching a 3-D movie that you could never have any form of physical interaction with. This is the equivalent to going back in time and killing your grandparents or parents long before you were born. How could such be achieved as you’re alive now? If you went back in time and successfully murdered your family ancestors, you would not be alive now to even attempt such. Kind of crazy, paradoxical stuff to say the least. 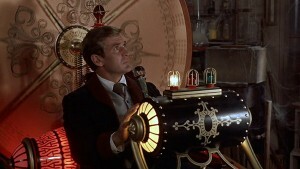 Well, after all that, you might ask yourself what good is a time machine? Well, it may allow us to better understand more about reality at many levels and might just tell of that we cannot ever play god. However. such technology might lead the way to the development of incredible new types of endothermic (non-heat generating) energy to power the world free of pollution as well as new methods for advanced medical healing methods. It may also provide us with the blueprint to build and apply real warp drive field propulsion for interstellar travel. 7. Almost forgot, the very last item you will need is MANY BILLIONS OF DOLLARS, as such technology does not come cheap. 8. Does any of this incredible physics have any interrelationship with paranormal events such as precognition, RSPK and apports? 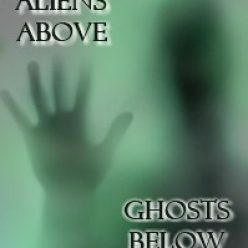 For much more detail on what’s discussed here, check out my book Aliens Above, Ghosts Below: Explorations of the Unknown at Amazon.com, Barnes & Noble.com and at www.cosmicpantheon.com.